Growing herbs together in your garden or containers can provide you with culinary flavoring, natural air fresheners and either attract beneficial insects to your other plants or repel harmful pests. You can grow a variety of herbs successfully, or experience disastrous results simply because a few important tips were not followed. Almost all herb plants require at least 4 to 6 hours of sunlight per day, but some herbs prefer more, such as lavender, rosemary, dill, thyme, marjoram and oregano. Some, such as mint, coriander and lemon balm, need afternoon shade or partial shade throughout the day. There are herbs such as basil, parsley and thyme that prefer to grow in moist soil, while rosemary likes a drier soil and should not be grown next to moisture-loving herbs. To be successful in growing herbs together, it is important your various herb plants are grouped according to their optimum growing needs, particularly concerning light and water. It is generally a good idea to plant your perennial herbs that come up year after year--chives, thyme and sage, for example--together. Plant your annual herb plants, such as basil, dill or summer savory, together so you can easily harvest, remove and replant those herbs. As you design the layout for your multiple herb garden, take into consideration the height, width and invasiveness of each herb. Plant the tall herbs toward the back of your garden plot so they will not shade the lower growing herbs. 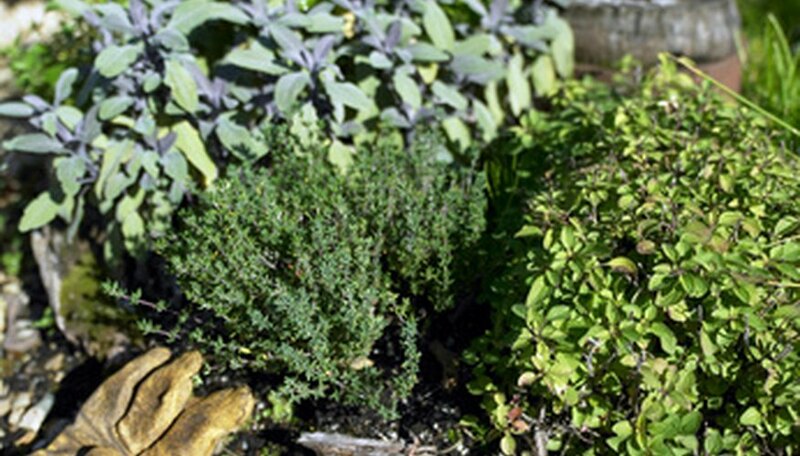 Leave enough space between your seedling herbs to accommodate the spread of the mature herb plant. And, unless you want a ground cover, it is best to plant mints and lemon balm in their own separate pots because they will spread and take over your garden or container. Some herbs help each other thrive, while, once in awhile, there is an herb planted with another that impedes the growth. Examples of good herb companions are parsley and chives, dill and chervil, and rosemary and sage. Rue, when growing near basil or sage, will inhibit each other's growth.